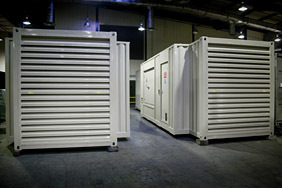 Identical containers, each housing a Cummins C1400 generator, are now complete and ready for dispatch. 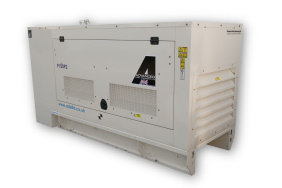 These generators will be providing stand by power at a private hospital in the London area. This was already a repeat order and ADE have also been selected as preferred generator suppliers for the contractors involved in the hospital project. 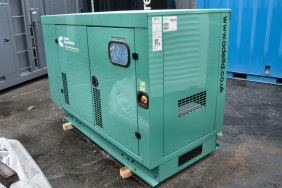 This Perkins powered 100kVA silenced gen-set is now on site in Aldershot Supplied by ADE Ltd, the generator is providing stand by powerat a waste recycling plant. Due to leave this week, these generators are still awaiting collection by the client. The severe weather has affected most of the UK. No more snow is predicted for this weekend but temperatures are forecast to drop below -7 degrees centigrade. 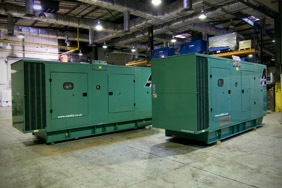 Two 500kVA generators are PDI'd and ready to leave ADE for one of our prestigeous clients in South Wales. Silenced, with an extended base fuel tank, this generator is now providing stand by power as a resident on a health authority site in Sheffield. 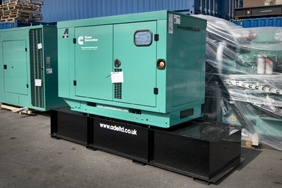 This silenced generator is now on site at a robotics engineering company in Whitehaven. 2 x 85dB(A) at 1 metre, perkins P900 FG Wilson gen-sets packaged for one of ADE's many partners. 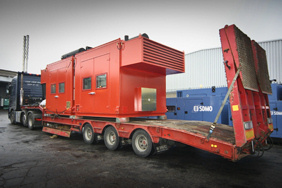 This 500kVA 30' (9m) containerised generator is ready to leave ADE for HMP Haverigg. Built to be super silent, the system runs at 65dB(A) at 1m. 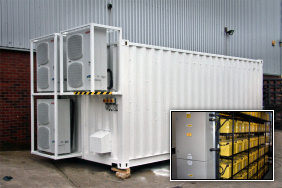 Shown here on load test is one of three 40' containerised generators with noise levels of 85dB(A)@1m and 50 degree ambient temperature radiators. Built for a client in Singapore with the end destination being Abu Dhabi. For use on a drilling rig. 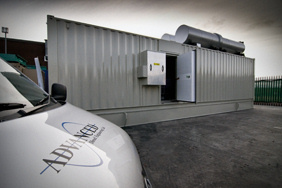 It is late October 2010 and ADE are establishing strong connections in the world of uninterruptible power supplies (UPS). 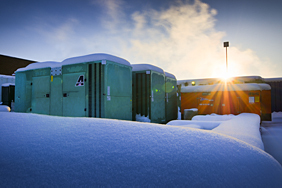 Our years of experience in the stand by generator power sector already includes countless UPS installations.However, we are now able to offer UPS installations as stand alone systems or indeed, as part of a wider generator project. 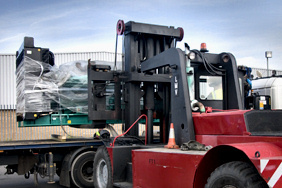 A standard Cummins 640kVA open gen-set is loaded onto a lorry to be delivered to a large UK ISP. 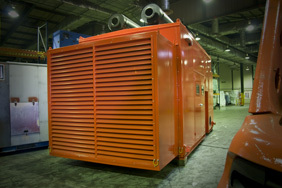 The generator will be located in a basement plant room. The installation and comissioning will be carried out by an electrical contractor, with the help of ADE's engineering and project management team. Another ten foot (3.05m) secure, sound proof container is ready to leave ADE, this time with a 150kVA Canopied Cummins generator inside. This generator will now also be utilised on UK construction sites, providing power to welfare facilites for the workers. This Cummins standard C22 has been fitted with a duct to channel the airflow to the outside of it's plant room building. Also supplied were a set of ADE manufactured louvres for the outside wall of the building. 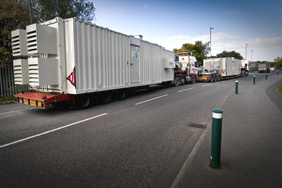 Two further gas generators leave ADE, destined for waste processing sites. 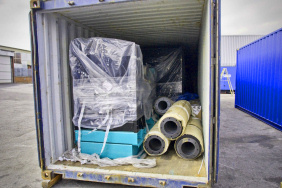 A third container was also shipped, loaded up with parts for the heat exchangers and exhaust silencers. A Cummins C500 has been fitted with a bund tray to hold any accidental spillages during it's life in operation on a farm in Sussex. Two pump station canopies leaving ADE. These canopies are now providing fire proof enclosures for two pumping stations in a harbour in the Channel Islands. In case of a fire, the pumps are on stand by to provide an emergency supply of high pressure sea water. They are designed to run at full power and to supply the maximum volume of water possible, at all times. Every now and again... ADE ship a Pramac Gen-Set. 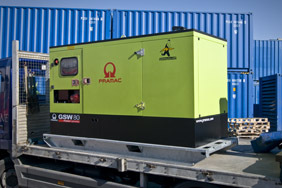 This compact 80kVA Pramac generator is now providing stand by power for an industrial engine company in the UK. 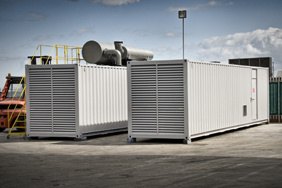 Housed in this secure, sound proof container is a 110kVA Canopied Cummins generator. 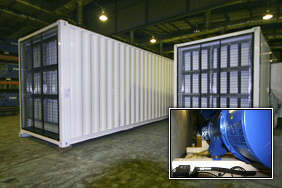 In addition to providing a secure storage container, the generator was also silenced. to 65dB(A) at one meter. Shown here leaving our test bays, this generator will now be utilised on UK construction sites providing power to welfare facilites for the work force. 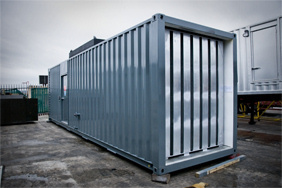 An ADE electrical engineer makes off cables in this containerised generator for HM Prisons. Inset is the container just one week previously. ADE project turn-around times are second to none. 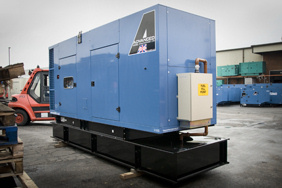 This generator will be providing stand by power for a low security prison complex in Yorkshire. Three of five 1250kVA (prime power) C1400's in the workshop at ADE. 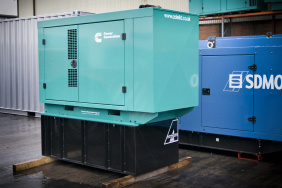 These generators will be supplied to a training hospital in Kent, providing emergency / stand-by power. ADE manufactured the control panels using InteliSys technology, now the generators can run synchronised or singular, they will also integrate with the hospital's BMS system. A number of hire generators are now in the workshop at ADE. 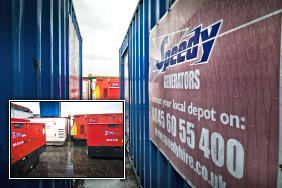 Speedy Hire, the esteemed generator rental company, have again chosen ADE to refurbish a large cross section of their fleet. 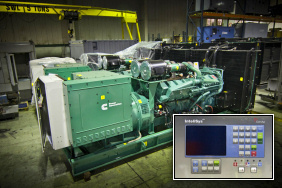 In addition to requiring a 'face-lift' the generators also require minor electrical, mechanical and some steel work. A Cummins C1675 has been installed inside this 40 foot shipping container. Seen here is the louvre splitter arrangement before final fitting of the weather louvres. 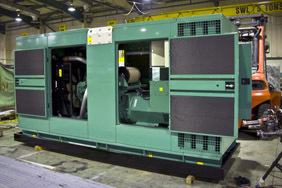 This generator will be providing stand by power for a cold stores in Norwich. A standard Cummins enclosed C80, shown here fitted atop a high autonomy fuel tank, manufactured at ADE Ltd. This generator will be providing stand by power for a group of self catering holiday cottages in the Lake District. 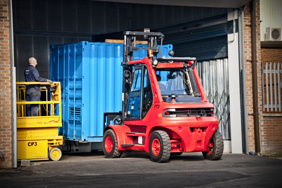 Three standard Cummins generators are loaded into a shipping container in the yard at ADE. 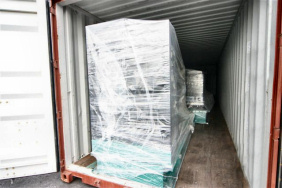 These generators are now headed to Africa to be used as prime power providers on various construction projects. 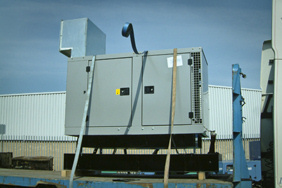 Part of an on-going contract, ADE supply another generator to HM Prison services. Now part of a generator plant room, the 1000kVA open gen-set is shown here undergoing the standard 4 hour load test in the testing bays here at ADE. Shown here is a modified Cummins C275 canopied generator with a 72 hour, custom manufactured fuel tank. The silenced gen-set is now providing stand by power for a private residence in Duxford, Cambridgeshire. Two Cummins C900's are containerised and shipped to Scotland. Undergoing final exhaust fitting, these generators are silenced to 80dB(A) at one metre. They will be providing a shared, N+1 standby power system for two adjacent banking data centres. A Cummins C110 with custom ATS panel shown in the yard at ADE. 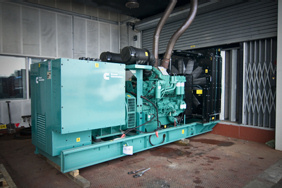 This generator is now providing stand by power for a crematorium in Lancashire, UK. 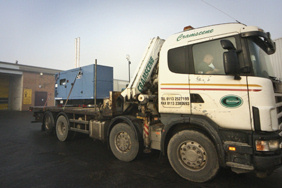 Cummins Powered generator system shown here being handled onto a low loader trailer. 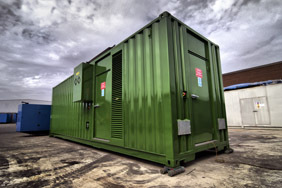 This 1675kVA, 40 foot containerised High Voltage (11kV) generator is now on site and providing stand by power for a project headed by a leading national facilities management company. 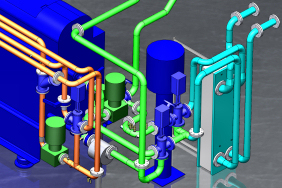 From start to completion, the manufacture of this system was only four weeks. Now complete is another stainless steel pump housing. This canopy will be providing weather protection and silenced containment for a series of fire pumps. Built to be air tight, the canopy incorporates a CO2 discharge system and automated louvres to help protect the unit in the unlikely event of a fire inside. 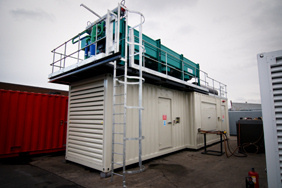 A customer specification required a 1000kVA stand by generator complete with a 72 hour, localised fuel supply. 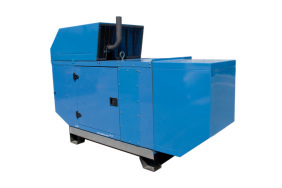 The generator was also specified to run at 80dB(A) at one metre. ADE were happy to oblige. 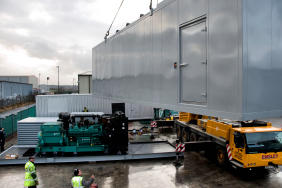 The generator is now on site, ready to be commissioned, at a UK Data Centre. Twin 40' (12.2m) Gas generators are undergoing final PDI before leaving ADE. Supplied to a leading energy provider who will be utilising them to convert human-waste-generated-gas into electricity to feed the waste plant, with any excess electricity being fed into the national grid. 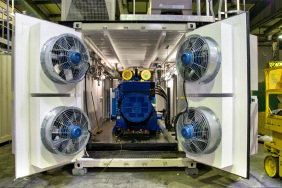 A standard J44 generator has been successfully modified and tested to reduce the noise levels without constricting the airflow. From the standard 76dB(A) at one metre, the canopy noise output has now been reduced to 62dB(A) at one metre. Further 'standard' canopy silencing is now being tested and ADE will soon have the full range of canopy Super Silencing kits for the lower end of the generator range. A relatively quiet three day event compared to previous years, although ADE secured orders for two combined heat and power plants, several high horsepower gen-sets and a 2250kVA generator as part of a large plant room project. 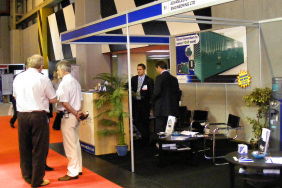 Thank you to everyone who attended our stand, all our representatives thoroughly enjoyed the event and made many valuable contacts, we hope to see you again in 2012! Multiple projects have been completed and shipped from ADE over the last two weeks. 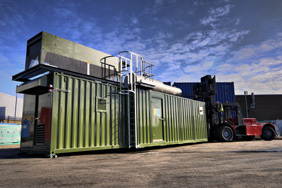 Pictured opposite is a container loaded with two Cummins C220 open generators and associated silencers and other equipment. This and another container with two C330's are now on their way to Nairobi providing stand by power for various industrial businesses. 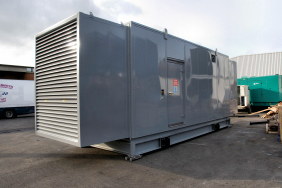 Sub contracted to ADE via a large national construction consortium, this 1000kVA generator is now providing stand by power for a Police Station in Surrey. 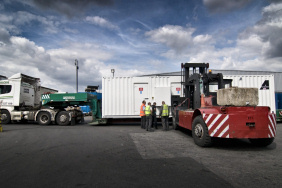 This year's first gas generator to be shipped is shown preparing to leave ADE, with another container currently in the workshop. A standard Cummins C38 canopied generator is fitted with a solar panel to aid in charging the battery. The gen-set has been modified to automatically start up to charge the battery if the solar panel doesn't provide enough power for charging and when the battery power drops below a certain level. 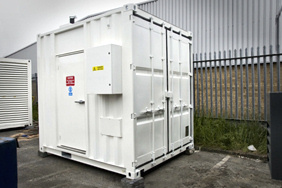 A silenced 10' low cube pump container with external connections. Part of a larger project with ADE providing fuel lines and bulk fuel storage tanks. Large custom, drop-over canopy for HM Prisons in Lancaster. 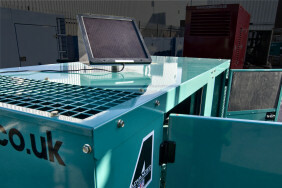 1100kVA stand by generator mounted on a robust heavy duty steel base frame. Includes 4000 litre fuel tank. 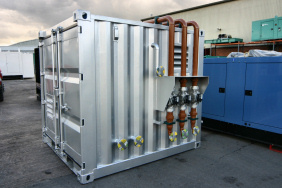 Bunded base frame can contain 110% of total fluids inside the enclosure. Again, a very low noise specification was required for this project as it is now providing stand by power for a high profile communications company. This system weighs in at 28 metric tonnes (gross). 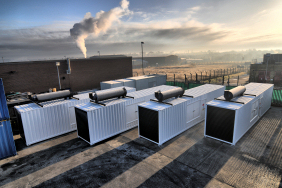 This row of 4 x 1650kVA containerised generators are now providing stand by power for data centres accross the UK. 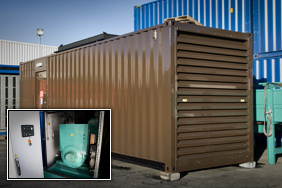 Two modified 20' ISO containers for a large Irish power systems company. 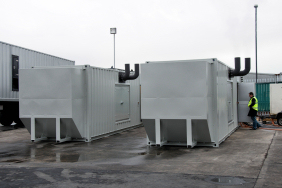 To lower the noise levels to the specification provided, the ends of the containers were extended with noise attenuated air inlet and outlet scoops'.